Please note, this article contains spoilers for Claudia Gray’s Lost Stars. Categorize: to put someone (or something) into a group of similar people or things: to put people (or things) into categories. Categories are how we create order, make sense of the world around us. With the Star Wars canon, we tend to sort and organize the stories into different categories, depending on our personal preference. 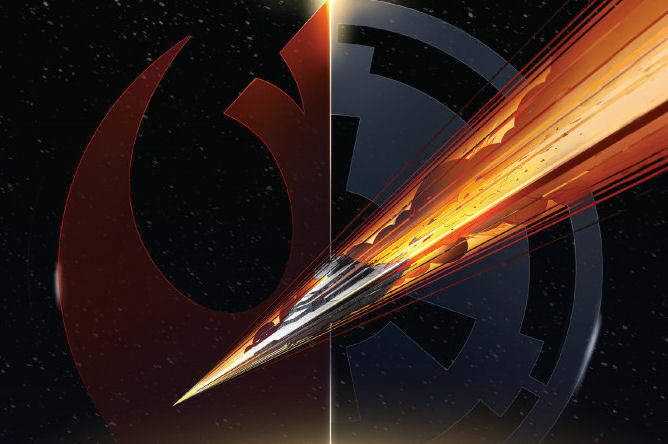 The prequel era, the classic trilogy, the era of Star Wars Rebels, post-ROTJ; these are all categories that have been used to define time as we explore the Star Wars canon. However, Claudia Gray’s Lost Stars bridges these categories, dramatically influencing our way of viewing the Star Wars universe. We tend to use the films as wayposts to explore events in the Star Wars canon. These provide those who have only seen the films some guidance as to when non-film events happen. However, one read through Lost Stars and the bookends we normally associate with our “eras” completely disappear. This novel begins eight years after the rise of the Empire, after Episode III: Revenge of the Sith. We are thrown right into the middle of the time between Episodes III and IV. There is nothing about this beginning point that relates to any existing material, any film or television show. We see the galaxy from the eyes of two children, eager to be admitted into the Imperial Academy so they can pursue their dream of flying starships. Early on in the story, there is mention of senators who are walking out of the senate chamber on Coruscant, hinting at the seeds of rebellion. This brings the story of the Rebellion to a point prior to the events of Star Wars Rebels, and well before that of Episode IV: A New Hope. Darth Vader’s capture of the Tantive IV is really the beginning of the original trilogy era. However, Lost Stars gives us a glance at Princess Leia, just a few weeks before this iconic scene. With only a few pages separating these moments, the line that begins the “original trilogy era” is blurred. The climax of Episode IV, the destruction of the Death Star, only serves to propel this narrative further. Immediately, we get to see the following action by the Empire to retrieve Vader. In the time between Episode V: The Empire Strikes Back and VI: Return of the Jedi, the Rebellion sends an X-wing squadron to scout out D’Qar, the planet that served as the Resistance base in Episode VII: The Force Awakens, a full thirty years prior to that film. Many times certain planets and locals are associated with a certain era, and it is great to see this reference here that provides a connection to that film. In Episode VI, the destruction of the second Death Star served as the final climax of the films’ narrative, and the overall climax of those three films combined. Both of the main characters in Lost Stars participated in that battle, but the result of this battle for each character was not the falling action of this story. The final climax of this narrative occurs during the Battle of Jakku, over a year after the battle of Endor. Does this downplay the significance of the events of Episode VI? To some degree, that is a matter of personal opinion. It does place more focus on the Skywalker Saga, and less of an emphasis on the actions of the Rebellion. In Episode VI, we saw the epic conclusion of the struggle between Luke, Vader, and the Emperor, and to that end, we did get a satisfying conclusion, but the rebellion fought on, as we have seen in many stories: Lost Stars, Shattered Empire, “Blade Squadron,” and Aftermath, just to name a few. Lost Stars has challenged our perception of time and eras in the Star Wars canon, and its influence will be felt throughout, allowing us a fresh new way to explore and discuss the stories of this universe. Let me know your thoughts by posting in the comments below. You can reach me at jbrame@coffeewithkenobi.com. I can also be found on Twitter: @starwarstce. You can find our coverage of #starwarscanon stories at our YouTube channel Star Wars: The Canon Explained. I love this book Lost Stars. When I finished it, I was left hurting for the main characters but also a sense that their story wasn’t completed yet. It was heart wrenching in a lot of parts and some scenes hurt to even read because you could see the build up coming and when it did, you just felt for each person involved. I really think that Claudia Gray really brought these characters to life and finally breathed some originality and the true Star Wars feel into the New Canon. I was really impressed with this book and intend to read it again. It’s been a little while since I read Lost Stars, Jason, so I hope I remember events well enough to discuss them here. Quite frankly, I did not feel like my perception of time was challenged while reading the novel, or when I was finished with it. There always has been a fair amount of crossover between the films and events that happen “outside” of their parameters, so I approached Lost Stars in that same vein. While I never have been a fan of the Empire side of the coin, I did like reading about two strong characters, their connections to the Empire, and how they viewed events going on around them. It certainly gave a good — and sound — description of a different point of view, including how others saw events that occurred from a certain point of view in the films. It’s not that I have been oblivious to those depictions and strong feelings those loyal to the Empire had. However, Lost Stars was a reminder that not everyone associated with the Empire was evil — basically, they, too, were intent on fighting for something in which they believed (however skewed I might think their thought processes were 😉 ). That’s an important aspect to be reminded of.